Keemala first opened its doors to welcome guests on 1 December 2015, and has since received overwhelming recognition for its unique design and concept. The resort proudly showcases Thai talents in not just the design and architecture, but practically all aspects of the resort including the hand-laid mosaic murals, custom designed furniture, textiles, and spa products and amenities. 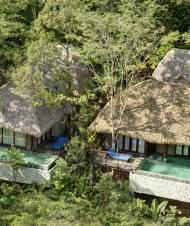 This past year, Keemala has blossomed into an impressive and enchanting forest retreat for guests to enjoy. The resort has won Condé Nast Johansens Awards for Excellence 2017, World Luxury Hotel Awards 2016, World Luxury Spa Awards 2016, as well as being included in the Condé Nast Traveller Hot List 2016, among other notable commendations. As a Thai owned resort, one particular objective has been clear from the beginning for all involved: to preserve and showcase Thai culture to visitors. Guests staying in Keemala are enticed to step beyond the sumptuous settings of the romantic villas, delicious cuisine, and pampering spa treatments to immerse in a world of traditions, nature, and the basics of living. Whether it is to enjoy a morning stroll in the organic garden with rescued water buffalos, packing traditional compresses with freshly picked herbs, or blending a concoction of natural herbal toothpaste, guests leave Keemala with an appreciation for the local, natural lifestyle. As Keemala ventures into its second year, the resort will be offering an even more enriching ‘Natural Lifestyle’ experience. Guests can learn to fold lotus flowers, extract herbs into fragranced oils, harvest and extract fresh aloe vera, fold fresh potpourri bouquets with pandan leaves, make pandan paper, and more. Through these complimentary holistic activities, guests will be introduced to Keemala’s sustainable and self-sufficient approach, and learn how the resort weaves this ethos into its luxurious experiences offered. Join Keemala’s very own Heritage Walk tour that takes guests into the heart and soul of ‘Phuket Old Town’ to learn more about the history of this island. Take a closer look into Sino-Portuguese shop houses with their dramatic emblems decorating the facades, and venture down alleyways long trodden by locals gathering for afternoon tea, trading amulets, or simply hanging out. For a truly authentic experience, stay in the cozy and welcoming Clay Pool Cottage designed to highlight the lifestyle of farmers, fishermen and mine workers whose lives depended on the richness and abundance of the earth. With natural sunlight beaming down to brighten the spacious bathroom, fully equipped with a soaking tub, and indoor and outdoor monsoon showers, the Clay Pool Cottages are the perfect home base for this wonderful journey. The private plunge pool is especially inviting for a mid-afternoon dip to cool down, with the lush canopy of nearby trees providing welcome shade. While at Keemala, feast on delightful and healthy cuisine at Mala Restaurant, with vegetables and herbs picked fresh from the resort’s organic garden. A visit to the award winning Mala Spa is also a must, where guests can lie back and relax to the expert touch of therapists and let the body and mind be rejuvenated. Mala Spa uses 100% natural and ethical spa products by Siam Botanicals, VOYA and SpaRitual, so guests can be truly at ease. To book a stay at Keemala or enquire about packages available, please contact [email protected].